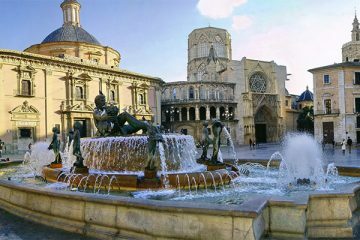 Have you been thinking of visiting Valencia, don’t you know what to do in Valencia and have you been looking for tours in Valencia? Here we offer you a street art tour in Valencia. In this urban art tour you’ll find murals and graffiti art of numerous urban artists who have turned the city of Valencia into a big open-air museum. Our urban art tour in Valencia starts in Calle Peydro and goes towards Plaza de la Merced, which is very close to Plaza del Ayuntamiento in Valencia. In this street, you can find graffiti art of the artists Hyuro and Escif. Hyuro is an artist born in Argentina who is currently living in Valencia. His pseudonym consists of both his first- and last name. Escif is one of the biggest representatives of the street art in Valencia and in many communities he is known as the Spanish Banksy. Besides these magnificent artists, many other artists in Valencia have also left their marks on the shutters of many local stores. A form of art that can only be enjoyed for only a short amount of time, when the shops are closed. 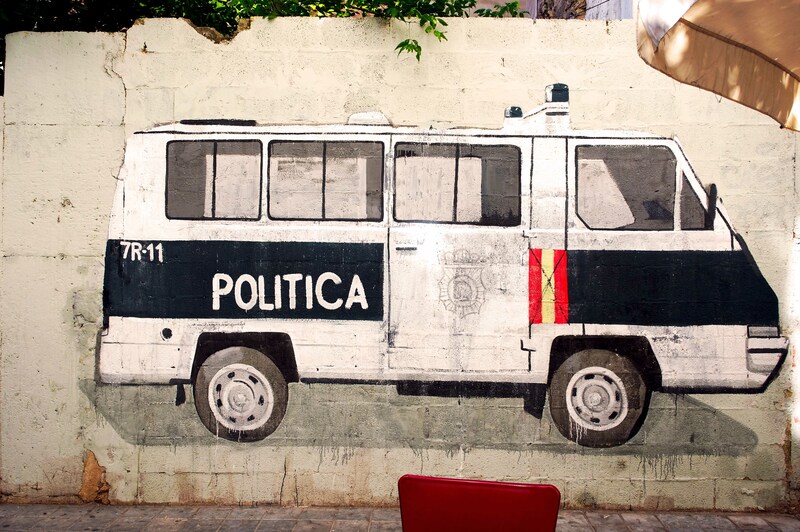 The most recognizable work in this first part of the street art tour is El Furgón Policial of Escif, which is a police van. 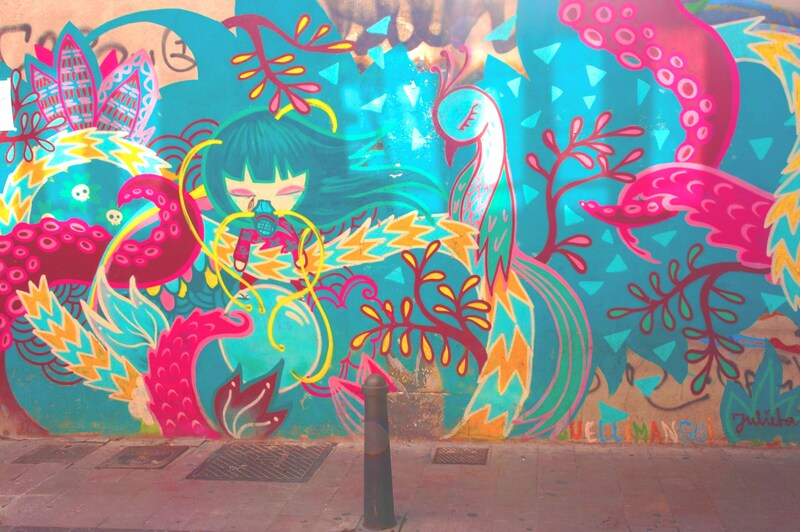 This work of art belongs to a serie of graffiti art in Valencia, that can be found in different areas in the city. This serie is designed to criticize the police brutality and the relationship of this with politics and in order to voice the protests of the citizens. that this square in Valencia is surrounded by street art. One that really stands out here is Austeridad by Escif, a work of art that was inspired by how different authorities take advantage of the citizens. The next magnificent graffiti in Valencia in grey tones shows the identity of Hyuro’s work. Hyuro always invites us to reflect on the weight of living in a city, the complexity of integrating into a society and last but not least, animal abuse. 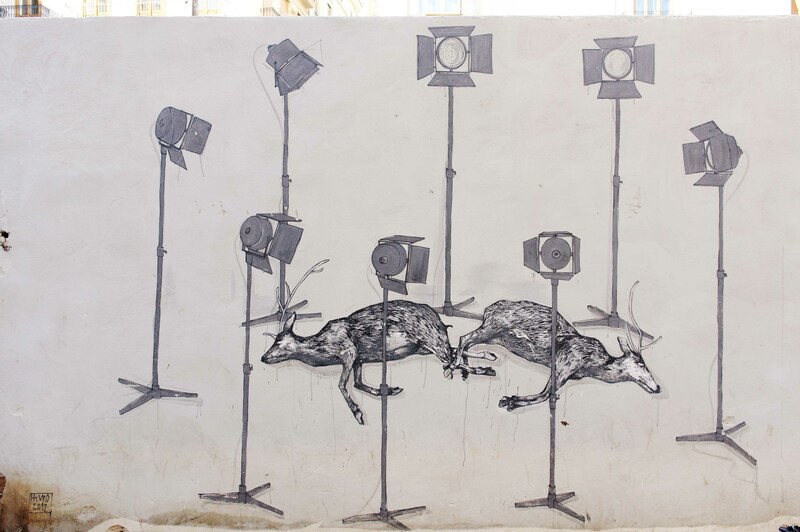 On this mural, you can see some badly injured deer surrounded by spotlights. The whole world can see them as if it is some kind of spectacle, but no on tries to help them. When you leave Plaza de la Merced and go into the street Calle Calabazas, you will see a wolfpack attacking a taxi. 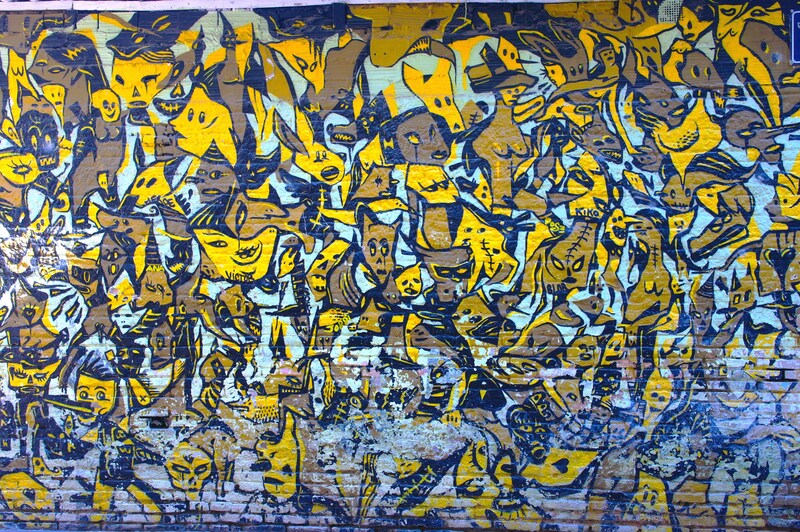 A mural that was created in a collaboration of Hyuro and Escif. 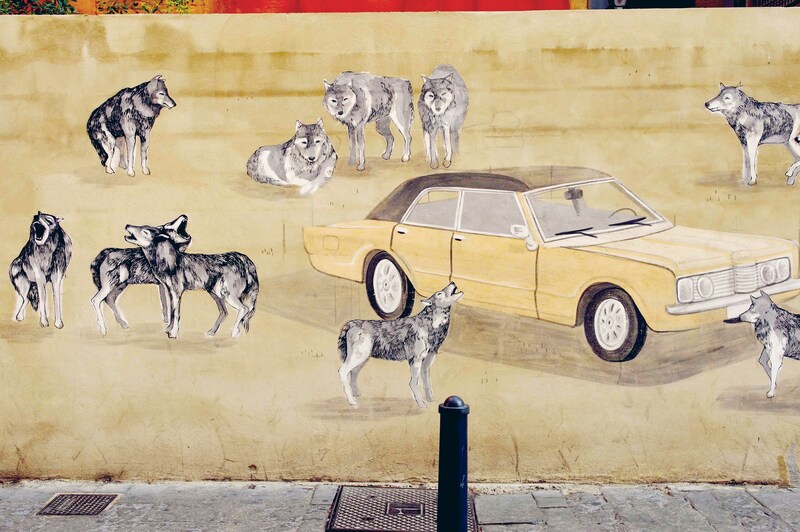 This piece of street art in Valencia shows two cars surrounded by a wolfpack. Mysterious work that arouses curiosity. If you continue walking in Calle calabazas, you can visit the Central Market, the Silk Market and the Santos Juanes Church. It is a superb area where you can either enjoy a nice breakfast, a snack or a lunch. When crossing Avenida María Cristina and going through Calle del Trench, you will find the round square Plaza Redonda on your right and on your left Plaza Lope de Vega, a place in which you will find a small house with a front that looks like a cross. 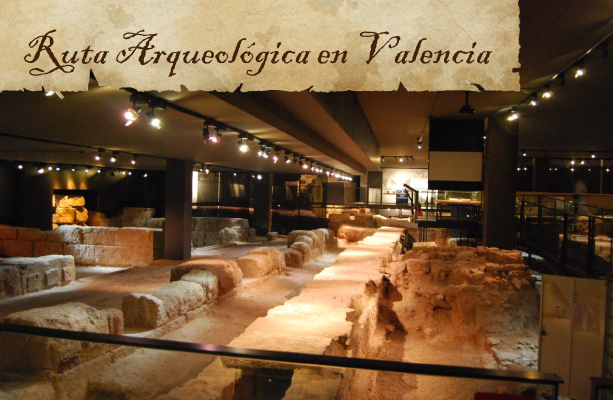 An initiative that is known by the name ArquiCostura, which shows the connection between the architecture- and the seam in Valencia. 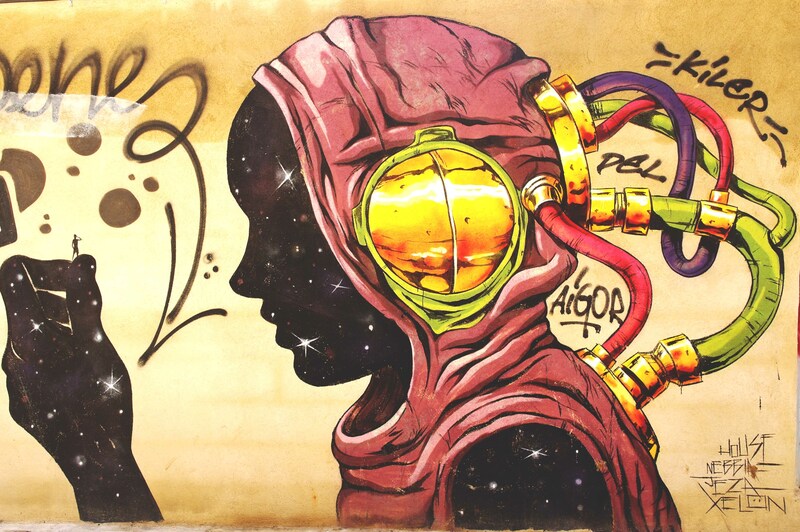 Next on in the street art tour in Valencia, walk towards the street Numancia, where you can observe various pieces of street art in Valencia with many bright colors, that were created by Hyuro and Escif. Continuing in Calle de la Purísima, and after in Calle Calatrava. 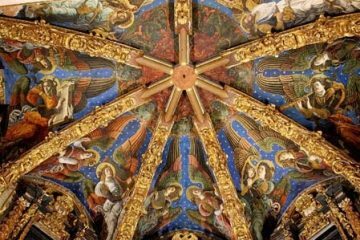 Turn to your left where you have the street of the Valencian, where you can admire some creations of the Valencian artist Cere and of Julieta XLF, both members of the group XLF (Por La Face). This group has contributed in making art to show disinterest to the city. 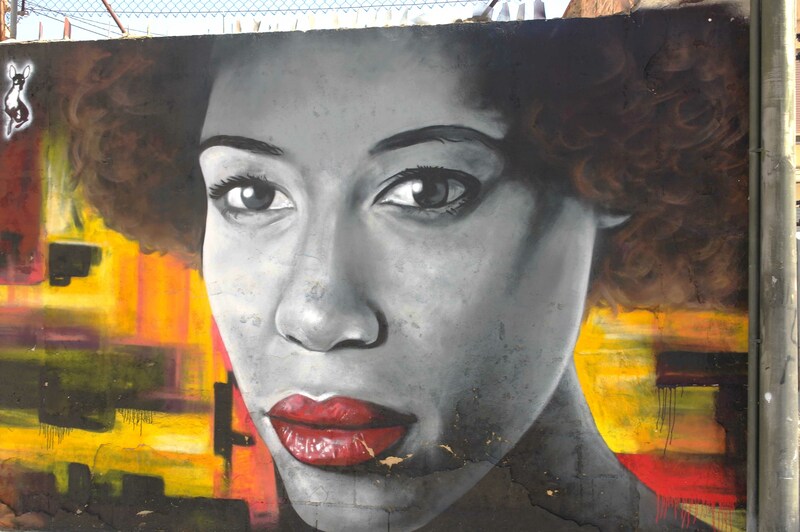 The group exists for 12 years already and their murals show the combination of all of their styles, which creates authentic works of urban art in Valencia. In the case of Julieta XLF, it is not necessary for them to leave their signature, since their work can be recognized very easily. Their illustrations include Japanese influences and their colorful murals are full of imaginary animals, sweet girls, plants and some rainbows that are very characteristic and speak for themselves. As opposed to the work of Cere, which are grey toned, simpler and always have a demonstrative message. 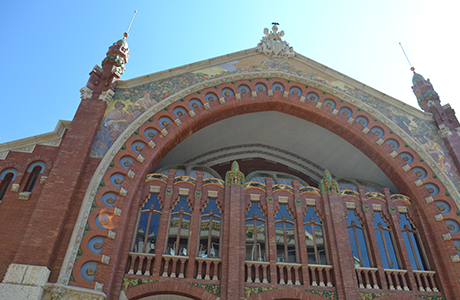 The next stop in this urban art tour in Valencia is Plaza del Tossal, which you can reach through Calle de Alvarez. 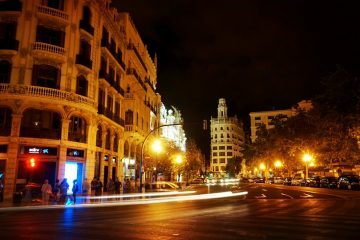 In Calle Caballeros you turn to the left and there you will find Plaza del Tossal. This square is located in the neighborhood el Carmen, and is a place where you can find various impressive urban art murals in Valencia. On the left you can see an image of a car, which rushes of a building. This is very clearly the work of Escif. On the right, you can see a representation of Moses, created by the Italian artist Blu. At the other side of the square, you can find an abstract work of art which s the Stop War Victim’s Wall, a tribute to all the victims of the war, which is influenced by the Guernica of Pablo Picasso. If you return to Calle Caballeros and cross Plaza de San Jaime, where you have Calle Alta and Calle Baja. Both have beautiful and enormous murals on the buildings. In Calle Baja you can find an urban mural which shows a rabbit strangling a chicken and a paella pan. This is the work of the Italian artist Erica Il Cane. This work of urban art in Valencia suggests that the chicken and the rabbit fight to death to decide which is the best ingredient for the authentic paella valenciana. Below them you see the paella pan and a group of people in grey tones who are waiting to eat and are watching the scene without intervening. 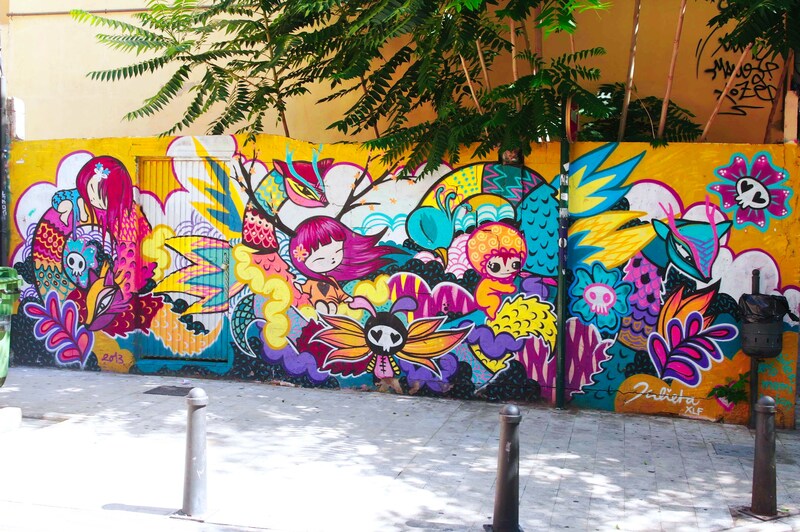 If you continue to walk, you can pass through Calle Corona, where you can discover a mural of a beautiful and colorful plant, on which a sweet and adorable girl is resting. This work of art also has Japanese influences and is also created by Julieta XLF. In the same street, you can find some graffitis of Blu, Eduardo Salvador and also some of Escif. 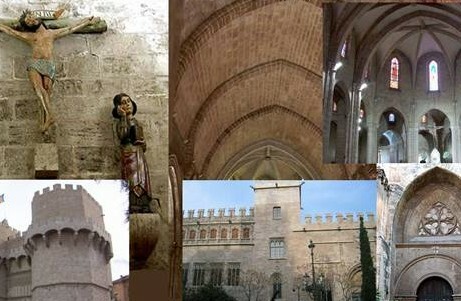 Great works of art in Valencia to enjoy. 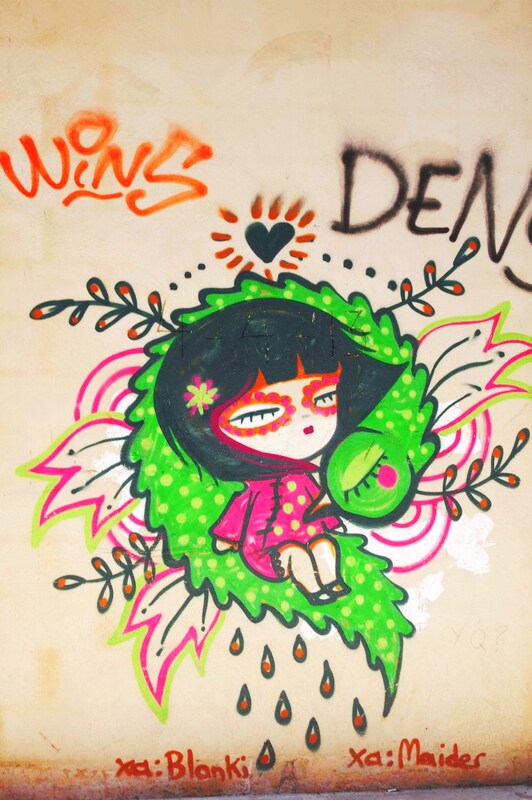 In Calle de la Benefcencia, you can enjoy a great number of graffitis in Valencia. Not all of them are of famous artists, however, highlighted are those of Julieta XLF. At the crossroad at Calle de la Beneficencia with Calle Ripalda, you can look at a variety of small graffitis of Julieta XLF and Deih, who is an Spanish urban artist, which murals are inspired by comics, just as Julieta XLF. But the difference between them, is that Deih creates dark figures who seem a bit lifeless, and which look as if they’re lost in infinite galaxies that spread solitude. This graffiti artist in Valencia continues to evolve and gets inspired by hip-hop without losing his own style, comics, books and cartoons. On the other side in Calle Ripalda, you can find calle Doctor Chiarri, where you are you can look at two very big, bright and colorful murals of Julieta XLF. 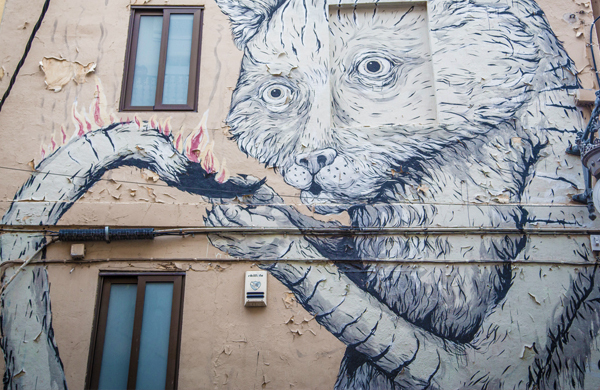 When you cross Calle de la Beneficencia, you can find Calle de Na Jordana, a place where one of the biggest piece of street art in Valencia is being shown. A great variety of urban artists have let their imagination run wild and have turned this place into a must-visit for those who love urban art. Here you have simple drawings, stylish and complex signs and realistic drawings. 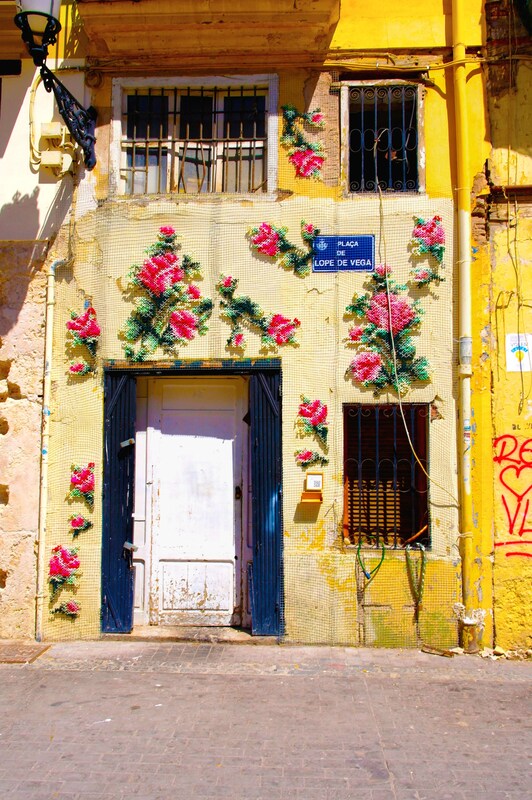 To end the urban art in Valencia tour, in Calle de Na Jordana, you can find Plaza de Bere Borrego and Galindo, which leads into Calle Museo, in which you can Casa de los Gatos del Carmen and the Iglesia del antiguo Convento del Carmen. After this street you can find Plaza del Carmen, where you can find the headquarters of the Asociación de Ciudadanos Mayores de la Comunidad Valenciana (CIMA), in whose facade a variety of murals represent the most important monuments in the city. In front of Plaza del Carmen, along Calle Pintor Fillol, you can look at various artistic photos that were turned into huge posters. Some of the murals show a portrait of the daily life of the inhabitants of Valencia and some are for instance classic cars on the garage doors. Last but not least, in Calle Roteros you can enjoy the demonstrative messages of Cere, the adorable Japanese dolls of Julieta XLF and the urban art murals that decorate some shops in the street. From this point, we would like to recommend you to visit the Serranos Towers. If you want to return to where you started the Street art tour in Valencia, you can take the bus lines 6, 16 and 26 of EMT Valencia, to Plaza del Ayuntamiento.